It has been 1309 days since my last non-trainer real bike ride and you probably think that I have been missing it. And you’d be wrong. People laugh when I say that I swim to TRI or I ride to TRI. They think I am joking really don’t understand that the other two disciplines which I practice are done only so that I can toe the line in a Triathlon. I swim and bike quite possibly so that I appreciate the run more. When I swim, I pray to my Lord & Savior to get me out of the water safely and onto the bike. When I am on the bike I am loudly cussing begging to be delivered to my running shoes. Then WHY do I TRI? I do it for the “fun“, for the challenge, and so that I will put my running shoes on a pedestal from which they will never tumble. I LOVE TO RUN. I AM A RUNNER. So the bike shop laughed when they saw my brand new bike from 2007. I put some serious miles on it in 2008 training for a 70.3 but as soon as the race was over, it went on the trainer and has not come off until its trip to the bike shop yesterday. Why, you may ask? I was trying for Mr. Michael and soon after that 70.3, I got lucky and conceived. I am a restricted activity preggo woman who is allowed to walk. Nothing else, walk. As if you don’t think a normal pregnancy is not an eon, now think of a preggo runner who is not allowed to jostle her little package, at all. I was told I could walk. I asked if I could elliptical and I was told, NO. “NO! No marathons for you. You can walk. You can only walk!”……Now go back and repeat that quote in a Japanese accent. It almost isn’t the same if you can’t hear the words in the Japanese accent of my 5 foot tall OBGYN. I could walk, I could only walk. Okay, I walked and ate. The two things didn’t go real well together. By now you have probably figured out that what goes into the body has to be somewhat countered by your activity level and your calorie burn. It wasn’t pretty but I had a beautiful baby boy so it was ALL worth it! On September 7, 2009 my bouncing baby boy arrived 366 days after that 70.3 in 2008. Lots of extra things going on with him so it took me a bit to get back to the run. 2010 & 2011 focused just on my lil man the run and now 2012 brings Triathlon back to me. One way or another, I’m going back to triathlon. I have already registered for two 70.3s this year. You may think it would have been wise to get back on the bike PRIOR to registering for a few races but that would be self-defeating. I knew I wouldn’t get back on the bike without the TRIs already on the schedule. So today was Day 1 of TTF on the bike. All I can say is OUCH. The first 13 miles with the wind at my back was awesome. Cold but awesome. The 2nd 13 miles was good because I was on the trail and I saw lots of my run friends, some of whom were doing their 20-22 milers today for the Illinois Marathon on April 28th. The last 13 miles sucked. Really sucked. Uphill into the wind sucked with tired legs, a sore upper body and a pain in the neck and shoulders. Sucked. Now I am totally wiped out, mad at the bike, and hoping I bounce back so I can get a good run in tomorrow morning. My number one thought on the bike: I’D RATHER BE RUNNING!!! What do you think about while you ride? 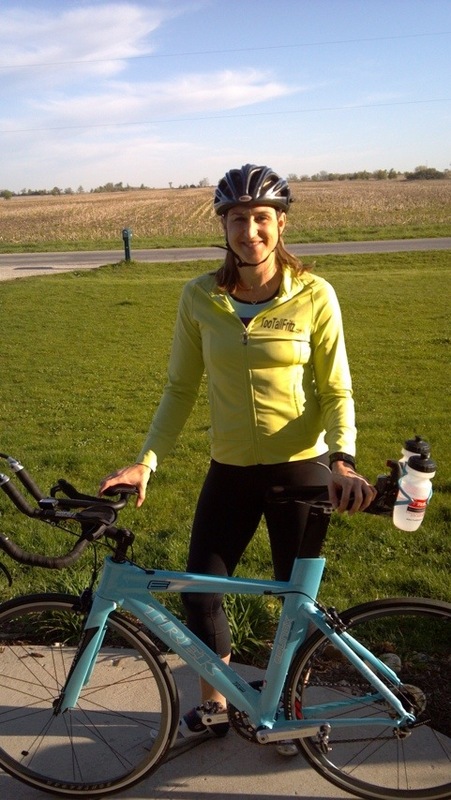 This entry was posted in Triathlon and tagged Bike Riding, Old Plank Trail, Running, Triathlon Training by tootallfritz. Bookmark the permalink. TTF…nice to hear you truly are a “mortal” triathlete and struggle with something. If it were me…the swim would be your bike struggle. I don’t struggle with the bike, but then I don’t competitively train on it much, mostly just following my friend at his 10-11-mph pedal-plod and find it quite enjoyable. When not with my friend and need some serious x-train, will pull out the Madone and do some serious distance and speed, but I rarely can get the average over 16-mph, cause so many crossings on trails and intersections and stop-signs and lights on the road that requires you to slow down…just in case. And going 20+ mph gets a little scary when the pavement world out there with all those flaws. But, if you road yesterday…it was quite uncomfortable riding into that E/NE wind. My friend always tells me bike out against it, and do the ride back with it. So…that’s what I do. Sometimes I try to structure the runs like that also if the wind really strong, or sometimes save it for the end and use the wind as resistance training to toughen ya up! Don’t know much about OBGYN, but aren’t there conflicting medical opinion on “only walking” while expecting. Didn’t Kara Goucher and Paula Radcliffe run to some degree well into their pregnancies? Be interesting to investigate that, but got too many other things to tend to. I like that….”the bike is my friend”. Probably a better mantra than “I hate this f***ing bike!” As for the preganacy, most woman can run while they are expecting but I can’t. It’s about me, my body and my risk for miscarry is high due to bleeding issues (if you must know). I rode this morning (SAT). Wind was bad. Since I ride out of my drive, to the trail and back, there isn’t much of a decision as to when I ride with the wind. It would have been better to ride against it first but that wasn’t an option. By the time I was tired and returning and fighting the wind it killed my average mph to 14.9 for a total (from around 20-22 getting to trail with wind at my back and rolling down the hills, then slower trail miles between all the road crossings, runners, dogs, people). It was hard to stay upright on the return with the wind and the stupid hills. I was almost at a standstill at times…..partly due to my lack of strength and poor fueling issues, partly wind. I had fuel, just not enough. Cycling is my #1 but I feel the same way when I swim – it is just a delivery system to the bike and the run – so I sympathize. I learned to love running so maybe I will learn to love swimming one day but I kind of doubt it. I try to look at it this way – if all 3 sports were as easy for me as cycling I probably wouldn’t enjoy triathlon as much. The feeling when I finish a triathlon is far more satisfying than finishing a century, half marathon, or even a marathon because I truly pushed myself to a place I wasn’t comfortable. That’s pretty cool! Great point and probably why I love it too. It’s not easy for me. Can’t even imagine getting to the point where I can do a Century. The bike (and my 2 year old) is what holds me back from the full iron distance.